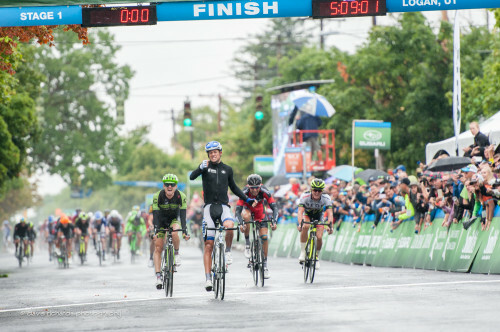 UnitedHealthcare Pro Cycling Team's Kiel Reijnen (USA) sprinted to victory in front of a fast-charging peloton to take the overall lead at the 2015 Larry H. Miller Tour of Utah. Reijnen outkicked his breakaway companions, Alex Howes (USA) of Cannondale-Garmin Pro Cycling and Taylor Phinney (USA) of the BMC Racing Team, who finished second and third respectively, at the Stage 1 presented by Smith's finish in Logan. 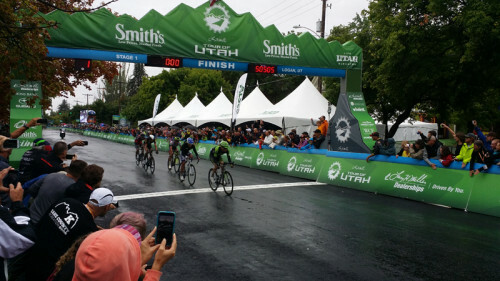 Stage 1 presented by Smith's began in Logan amid wet conditions and covered 132.1 miles, the longest opening day in the 11-year Tour of Utah history, with 6,553 feet of elevation gain. 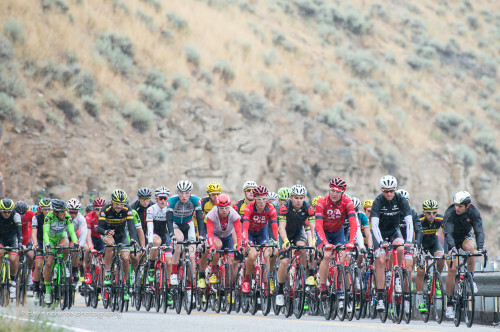 The Tour of Utah began today with 121 riders, representing 24 countries, on a 712-mile journey across Utah and Idaho for seven days of racing, August 3-9. 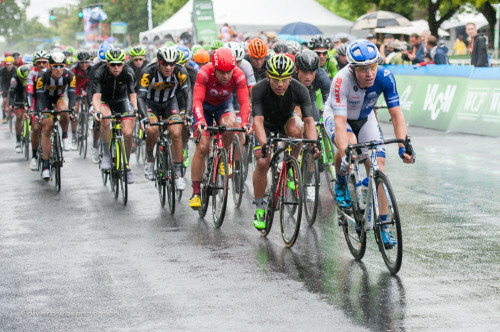 Upgraded to a 2.HC sanctioned stage race by the international governing body of cycling, Union Cyclist Internationale (UCI), the 2015 Tour of Utah offers a total of 51,442 feet of elevation gain for the week. Wily riders Reijnen, Howes and Phinney took advantage of the terrain in the finishing circuits to connect to the dwindling early breakaway in the final four miles. “I felt pretty terrible with 15 kilometers to go, I was shivering for an hour. Then I took my jacket off and went back to the car and [BMC Racing Team DS] Jackson [Stewart] told me the time gap. I just put it together that the sprinters team were working really hard and that with the wet, and also the tiny little climb on the circuit, it could be a good opportunity to go for it,”explained Phinney who was sidelined 62 weeks since fracturing his left leg and injuring his left knee in a crash in May of 2014 at the USA Cycling national road championships in Chattanooga, Tennessee. The riders climbed Logan Canyon for the first Utah Office of Tourism King of the Mountain climb at 7,799 feet before descending into Garden City. The race rolled through Idaho for the first time around the north side of Bear Lake before returning through Garden City and Logan Canyon, for the second KOM of the day. The stage concluded with two circuits in downtown Logan, on the same course that featured the Women’s Edition: Criterium Classic a few hours earlier. Seven riders escaped in the early miles of the stage and established a 14 minute lead over the peloton at one point during the stage. The breakaway consisted of Johan Van Zyl (South Africa) of MTN-Qhubeka pb Samsung, Carlos Ramirez (Colombia) ofTeam Colombia, Joe Schmalz (USA) of Hincapie Racing, Emerson Oronte (USA) of Team SmartStop, Greg Daniel (USA) of Axeon Cycling, David Williams (USA) of Jamis Hagens-Berman p/b Sutter Home and Josh Berry (Australia) of Team Budget Forklifts. 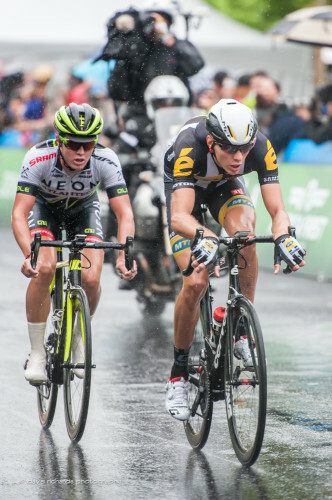 The breakaway riders worked together to push their gap to almost 15 minutes in the rain as the temperatures plummeted to 58 degrees. Behind, a combination of general classification and sprinters teams, such as Drapac Professional Cycling, Cannondale-Garmin Pro Cycling, UnitedHealthcare Pro Cycling Team and Airgas Safeway Cycling Team, led the chase at the front of the field. The gap was down to six minutes by the time the breakaway riders rounded Bear Lake to start the climb up Logan Canyon for the second time. Three riders fell off the pace, leaving Daniel, Van Zyl and Oronte to continue to battle at the front. The trio hit speeds of 45 mph on their descent on the wet roads heading back to Logan and the finishing circuits. More teams, including Bardiani-CSF and Team Colombia followed by BMC Racing Team, UnitedHealthcare Pro Cycling Team and Drapac Professional Cycling added riders in the rotation, reducing the gap to three minutes with 11 miles to go. Facing a headwind on a descending false flat, the trio of escapees were still working together, and trying to hold everyone off with less than eight miles to go. Oronte was dropped two miles later. Van Zyl and Daniel held a gap of 25 seconds as they entered the first of two finishing circuits. Sensing a possible bunch sprint, sprinters teams manned the front of the field but three savvy riders jumped away. Initially, Reijnen, Howes and then Phinney bridged across to the duo and immediately went to the front to set a fast pace. Though only 10 seconds separated the five riders from the charging field on the bell lap, it was enough for the break to make it to the line. 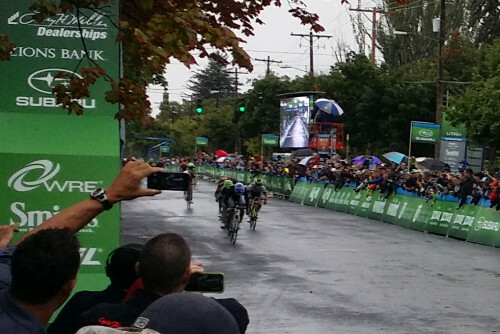 Reijnen came around Phinney, who led from the last corner, in the final 500 meters for the win. Howes, Phinney, Daniel, and Van Zyl made up the top five, staying just ahead of the charging field. For Daniel and Van Zyl, the high placings were at some reward for being in the break all day. “I didn't play the sprint so well. I had a little bit of a gap coming out of the last corner. I just hit it. I don't know, just a bit nervous I guess,”Phinney continued. Eric Young (USA) of Optum p/b Kelly Benefit Strategies took the field sprint for sixth place, crossing the line four seconds later. Daniel took the points for the two Utah Office of Tourism King of the Mountain climbs and will wear the KOM jersey on Tuesday. 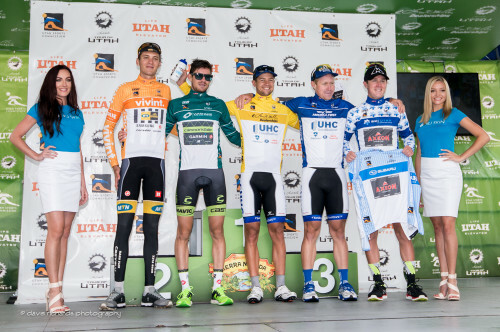 Van Zyl was awarded the Vivint Most Aggressive Rider jersey and fans have chosen Utah’s Tanner Putt (USA) of the UnitedHealthcare Pro Cycling Team as the America First Credit Union Fan Favorite. Utah riders Tanner Putt, Chris Putt, and Robbie Squire finished safely in the main pack. Stage 2 presented by Workers Compensation Fund will see the Tour start for the first time in Tremonton. The 100.3-mile stage 2 will start at 10:45 a.m. on Tuesday, August 4. Racers will enjoy the wide, rural roads of Box Elder County, including the famous Fruit Highway (Hwy 89). Rolling along the Wasatch Front through Honeyville, Brigham City, Perry and Willard, the race will then enter Weber County and the city of Ogden. Unlike the relatively gentle slopes found earlier, this part of Stage 2 features a 10 percent average gradient as riders circle around Pineview Reservoir and tackle North Ogden Divide. Then comes the rapid descent back toward downtown Ogden. Fans will witness three laps around a 2.28-mile circuit with a thrilling finish on historic 25th Street.